KCBS television caught the long exhaust plume on camera as it arced into the evening sky west of Los Angeles on Monday night, sparking reports of a missile launch. But The US military has so far been unable to explain an apparent missile vapour trail off the coast of California, and is still trying to determine its cause, a Pentagon spokesman said. Pentagon officials were stumped by the event. 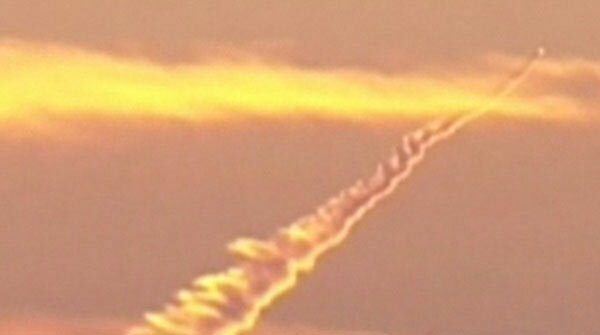 "Nobody within the Department of Defense that we've reached out to has been able to explain what this contrail is, where it came from," Pentagon spokesman Col. Dave Lapan said. The North American Aerospace Defense Command, or NORAD, issued a statement jointly with the U.S. Northern Command, or NORTHCOM, saying that the contrail was not the result of a foreign military launching a missile. It provided no details. "We can confirm that there is no threat to our nation," the statement said. "We will provide more information as it becomes available." And this Wednesday, on MSNBC an expert in Aeronautics commented that in that area of the West of the country they are always testing different kind of airplanes and other aerial artifacts, about which the general public is not informed. I concur totally with this expert and I would like to suggest that what was seen was a second test of the hypersonic X-51, which had its first test on Sping of 2010, and of which there has been no intention so far to give information to the public. This video illustrates the test. Or it could have been another test of the anti-ballistic missile Arrow for the Israeli Defense, which are tested in the United States, and precisely in California. An Arrow anti-ballistic missile is launched as part of the on going United States/Israel Arrow System Improvement Program (ASIPP). The missile successfully intercepted a short-range target during tests at the Point Mugu Sea Range in California. This was the twelfth Arrow intercept test and the seventh test of the complete Arrow system. The objective of the test was to demonstrate the Arrow system’s improved performance against a target that represents a threat to Israel. The test represented a realistic scenario that could not have been tested in Israel due to test-field safety restrictions.